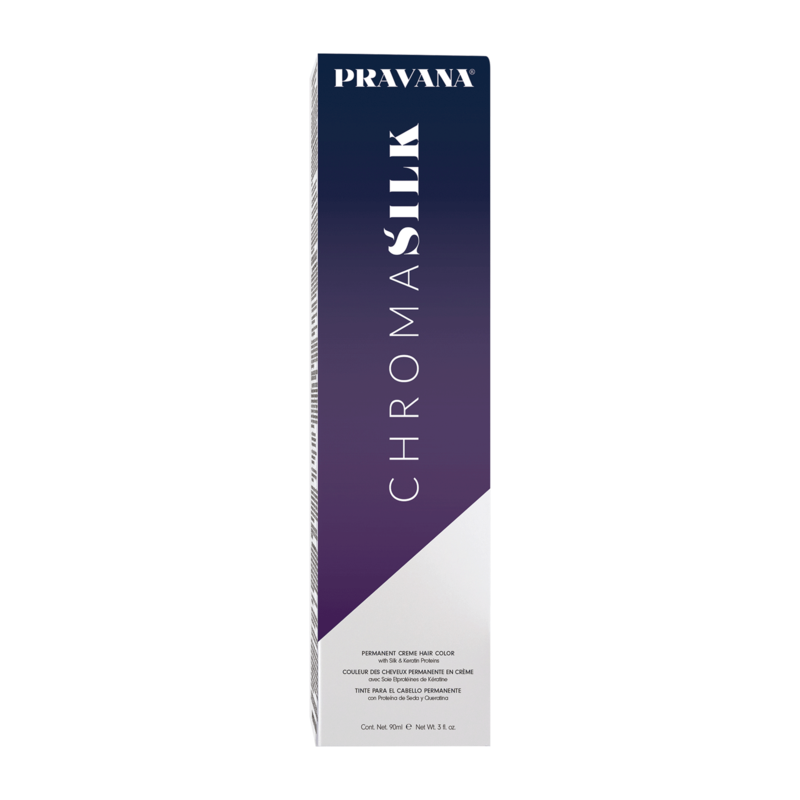 Enriched with Pure Silk and Keratin Amino Acids, ChromaSilk Permanent Creme Color provides brilliant shine, silky texture and long-lasting color. ChromaSilk’s award-winning formula provides complete gray coverage with rich, vibrant results. Its low ammonia content preserves the integrity of the hair and allows colors to perform as both permanent and demi- permanent simply by switching to PRAVANA Developers. In a non-metallic bowl, mix one part permanent color with 1.5 parts creme developer 10-40V (1:1½ ), and apply color. Process for 30 minutes -- up to 45 minutes for gray coverage. WATER (AQUA, EAU), CETEARYL ALCOHOL, PROPYLENE GLYCOL, PEG-4 RAPESEEDAMIDE, CETEARETH-25, AMMONIUM HYDROXIDE, PARAFFINUM LIQUIDUM/MINERAL OIL/HUILE MINÉRALE, FRAGRANCE (PARFUM), SODIUM SULFITE, POLYQUATERNIUM-22, DICETYL PHOSPHATE, CETETH -10 PHOSPHATE, AMODIMETHICONE, EDTA, TOLUENE-2,5-DIAMINE SULFATE (CI 76042), OLEYL ALCOHOL, C12-14 SEC-PARETH-7, P-AMINOPHENOL (CI 76550), SODIUM HYDROSULFITE, C12-14 S EC- PARETH - 5, SIMETHICONE, ERYTHORBIC ACID, 2,4-DIAMINOPHENOXYETHANOL HCL, LINALOOL, D-LIMONENE, LANOLIN ALCOHOL, ACETIC ACID, PHENOXYETHANOL, M-AMINOPHENOL (CI 76545), METHYLPARABEN, ETHYLHEXYL METHOXYCINNAMATE, HYDROLYZED COLLAGEN, ALCOHOL, HYDROLYZED WHEAT PROTEIN, HYDROLYZED KERATIN, PROPYLPARABEN, IODOPROPYNYL BUTYLCARBAMATE ETHYL ESTER OF HYDROLYZED SILK, DMDM HYDANTOIN, BHT.